If you actually could choose, what would it be? Living in the 19th century could be waaay better than you ever imagined. If it were possible for you to live in the romantic era of the mid-1800s, would you consider it? Yeah, I know I keep rambling on about the 19th century, but when you've just written an entire novel where your main character travels to the past, it kind of sticks. In the 19th century, a gentleman was always expected to dance the first set of dances with the lady accompanying him. Only with the finest respect would a young lady be treated - being handled with the utmost regard by a gentleman during a celebration or ball was considered the normal standard of that time period. A Victorian young lady would dance with all gentlemen who asked in the proper, polite manner, with a courteous deep bow and gallant outstretched gloved hand. To decline or act indifferent or bored was regarded as simply rude. Even though the waltz wasn't socially accepted when it first arrived because of the couple's close position, it eventually became the most favoured dance during the 19th century. It was the only time when holding one another close while in public was acceptable. A slow waltz would make a heart flutter and an imagination soar. The music was stirring, passionate and fanciful. If the gentlemen requesting the dance wasn't known to the lady, he was very cautious in his conversation. At the end of the waltz, though the couple had just danced in an intimate and romantic style, the gentleman would never be so forward as to assume he could sit beside the lady after escorting her to a seat. 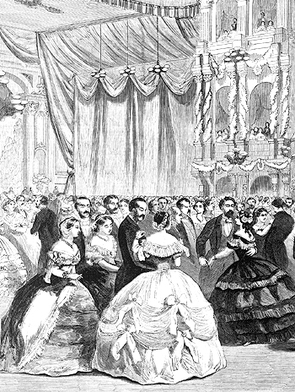 With swirls around the ballroom, the polka brought gaiety, laughter and happy music to celebrations. Whether slow steps or a gallop, its robust moves created smiles on everyone involved: those dancing and those watching. Originating in Bohemia in the mid-19th century, the polka trend became so famous it was referred to as "polkamania". The beginnings of the dance and accompanying music are often attributed to a young woman, a housemaid in 1830, when she was noticed to dance in an unusual way to the music of a local folk song.